This medium thin wrap piqued my interest back at the Wrapture Australia meetup in the city a while back, and I was super excited to be able to test it for a little bit after. Adam didn't let me wear him much at the meet, and Zen Laguna was one wrap that I didn't get to try, so I needed that extra time to get to know this wrap! Zen Laguna has a lovely drape and was kitten belly soft when I had it, which is a huge plus in my book. It has beautiful texture too, which takes up the already pretty pattern up to another level. Zen Laguna's subtle geometric design is right up my alley. I like how the lines are curved just enough to soften up the overall look. In fact, you'll notice that the lines and the specific shade of green almost calls to mind some form of fauna. I really like it! It's no secret that I'm a sucker for cushy wraps, and I have to say that the thinness of this wrap in hand belies its squishy nature! It's the kind of thin that results in effortless pleats, as seen in these photos, so I was surprised by how kind it was to my shoulders, with no digginess whatsoever. Don't judge a wrap by it's feel in hand, people. Zen Laguna has great grip and glide - passes were easy to make and stayed in place with no adjustments needed. I loved it in a DH with freshwater and saltwater finishes! I also played with one-shoulder finishes - just to see how it held up - and it was really easy to tighten and keep the tension. A big plus for me because I always struggle with upper rails in one-shoulder finishes. It's just hard for me to keep the tension, for some reason! But Zen Laguna made it so easy. The little bit of stretch in this wrap is just enough to make it moldable without being saggy. Combined with its squishiness, this makes it a true squish to toddler wrap! I loved how Adam felt supported through long naps, and how my shoulders did not suffer at all. I'm finding myself moving away from my squish-friendly wraps in my stash these days in favour of the tougher, toddler-friendly wraps, but I really should give some of them a chance. 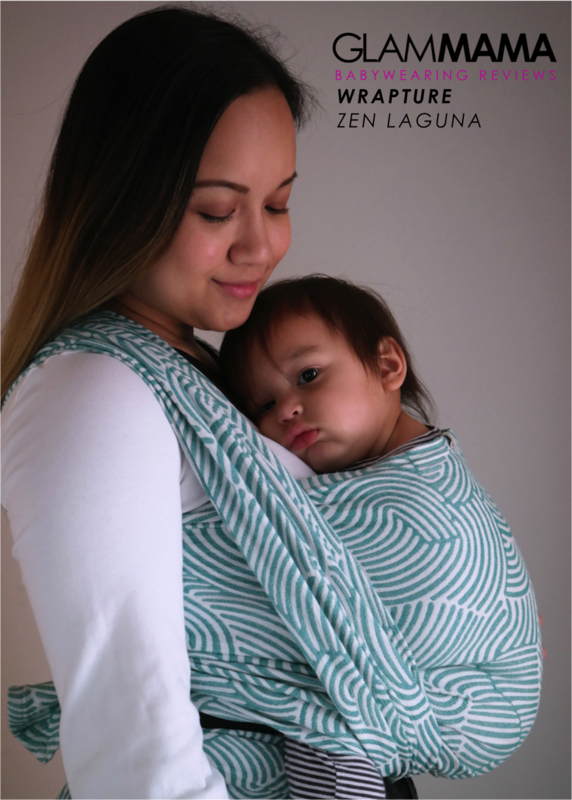 I miss that old blanket feeling that you get from squish-friendly wraps, but I also really need excellent support in my wraps, and Zen Laguna definitely delivers in that department. To read more babywearing reviews, CLICK HERE!